The concept of working from anywhere in the world, often referred to as digital nomadism, is on the rise. More staffers are looking to break free from the office cubicle, and more companies are opening up to the idea of employees working remotely. All you need is a laptop and Wi-Fi, and you can work from virtually anywhere in the world. Unfortunately, working while traveling can be more difficult than it seems. Many people confuse having a to-do list with all of their daily tasks as having an organized day planner, but they're two separate things. A to-do list doesn't have time frames on it and it can end up being an overwhelming reminder of how much you have to do. An organized day planner will break your to-do list down into manageable chunks with set times in which to complete those tasks. Getting into a steady routine is helpful for any working environment, but it becomes crucial when you're traveling at the same time. It can be all too easy to head out and see the sights in the places you're visiting, only for work to fall by the wayside. By establishing routines, you automatically start to prioritize certain tasks and they become a normal part of your daily or weekly workflow. Your routine is a personal thing, but try and get into the practice of doing certain things at the same time on a regular basis so they become habits rather than chores. For example, I routinely check and reply to my emails when I get up in the morning, then I exercise, and then eat breakfast before starting my day. As appealing as a secluded beach hut on a deserted island may sound, if it has no Wi-Fi, or even electricity, it'll effectively ruin your ability to do any work. Also, accommodations with too many distractions like a buzzing bar and social pool area might be just as hard to work in, so settle for something that offers a quieter working environment. It should still be close enough to the local action that you're able to head out and explore when you want. In addition, a winning accommodation should have all of the conveniences that you need to feel at home and help you save time. That means a kitchen where you can prepare food if you want to, facilities to do your own laundry instead of having to find a laundromat, and above all, a speedy internet connection. I used to plan my time on a day-to-day basis around which tasks happened to be the most pressing. It didn't take me long to realize this is a chaotic way of doing things, and in fact, can't really be considered planning ahead at all. In my experience, the most effective way of working on the road is by organizing your day planner for a whole cycle. Most of my work is done on a monthly basis, so toward the end of each month, I plan out my working days for the entire following month. Choose the tasks that you're going to be able to do most easily when you're in transit, ideally things you can do offline, so you're not relying on an internet connection that may not materialize. It takes practice to be able to work in less than ideal situations, so don't expect to immediately be at your most effective the first time you try it. However, once you get used to working with distractions around you, you'll find you can get things done virtually anywhere. Noise-cancelling earbuds can be a big help. Technology undoubtedly has its dangers, and it's easy to fall into the trap of mindlessly scrolling through your Facebook feed and watching endless cat videos instead of knuckling down to work. But as much as it can be distracting, technology is also a powerful tool to harness for your own good. Upgrading your travel electronics can have a huge impact on your work efficiency. If your laptop and phone are constantly bogging down, then you're wasting time on them. You might be surprised just how much time you spend looking at that hour glass or color wheel while waiting for programs to load or perform a task. Once you make the necessary upgrades, you can cut down your work time considerably. Buying a local sim card can also give you both freedom and a reliable connection, and often packages are cheaper in foreign countries. This will allow you to tether your laptop from your smartphone, meaning you're not reliant on intermittent Wi-Fi or holing up in coffee shops for days on end. Slow travel is amazing in not just allowing you to spend more time exploring each destination, but you also spend less money on average while you're there. 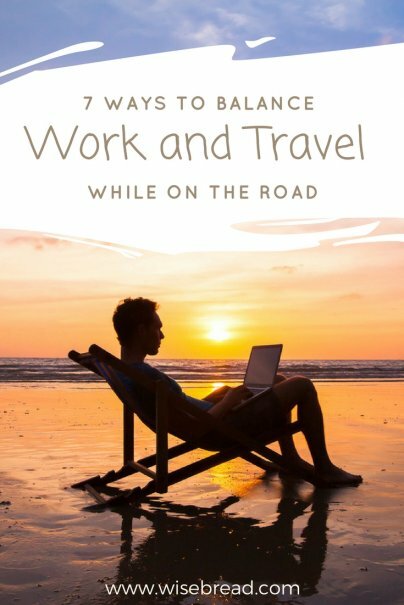 It's also ideal for balancing your work with travel because you don't have to rush around fitting a lot of things into a short span of time. You have enough time to focus on both your work and your travels so you don't have to sacrifice one to do the other.